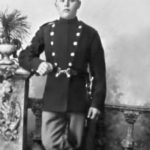 William Henry “Hank” Gleason was born July 26, 1857, in Putnam County Missouri, to George H. and Mary Ann (Griffin) Gleason. Hank’s 4x great-grandfather, Thomas Leeson\Gleason, settled in Watertown, Massachusetts, in 1652. 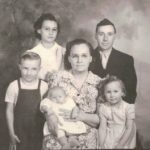 Mary Ann’s family roots also go back to the early 1700s, in Connecticut. Hank’s parents stayed in Missouri all of adult their lives, Mary Ann died in 1893 and is buried in the Torrey Cemetery at Putnam County, George passed in 1907, while visiting family in Oklahoma. He is buried in the Liberal Cemetery, Seward County, Kansas. Louisa Emeline Dunning was born August 30, 1861, in Moscow, Freeborn County, Minnesota, to James Arthur and Helen Adelia (Gates) Dunning. The Dunning family arrived in America in 1642 and Louisa’s great-grandfather, Silas Dunning, fought in the Revolutionary War (Ancestor # A035062). The Gates family were also early settlers in America. 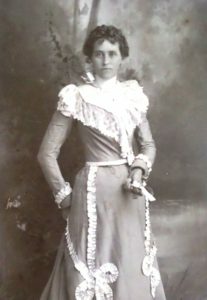 Louisa’s father died in 1889, at Florissant, Colorado and her mother remarried and moved to Elberton, Whitman County, Washington, where she spent the remainder of her life. On March 29, 1881, Hank and Louisa were married, in Rooks County, Kansas, where four of their children would be born, two daughters dying in infancy. Sometime in 1889, or early 1890, Hank and Louisa were on the move West. They were in Ashley, Utah for the birth of their son, Charles Henry, on February 18, 1890. In 1892, the family was living in Forest Grove, Washington County, Oregon, where their daughter Elizabeth Eveline “Bessie,” was born. 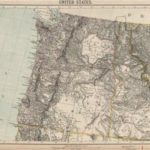 By 1896, the family was in Whitman County, Washington where a son Edward Bryan, in 1896 and daughter Violet Alice, in 1898, were born. 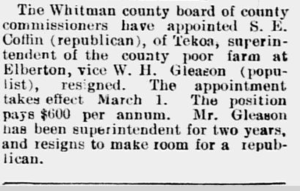 Hank served as Superintendent of the Whitman County Poor Farm from 1897 to 1899. Black Javas–W. H. Gleason, everything. White Cochins–W. H. Gleason, everything. Fine exhibit of Birds and Good Bench Show–Many Prize Winners Present. …Among the local fanciers there are many entries of fine show birds including the best from the Sweetwater Poultry Farms, from W. H. Gleason’s prize pens, from Miss Berns’ yards and from Jones’ and Dose’s yards. In 1902 Hank and Louisa’s sixth daughter, Mabel Josephine would be born, completing their large family. 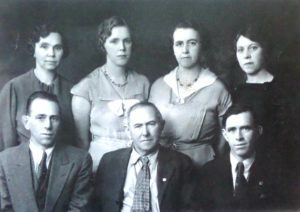 Eventually the family would move to the Orofino area, the 1910 US census show Hank, Louisa and their five children living on Orofino Street, in Orofino. Their son Edward Bryan had died in 1908, after contracting Typhoid Fever, and is buried at Hill Cemetery, in Orofino. 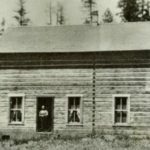 Hank was working as a contractor and according to his granddaughter June (Gleason) Snyder, he along with his sons, George and Charley, were brick masons and worked on several of the buildings still standing in Orofino today. In 1911 Hank apparently went to Shushartie Bay, British Columbia and worked as a carpenter, he is listed in the Canadian Census, living in the home of Harold Kemp, as a lodger. 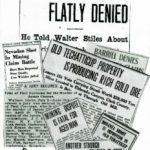 The rest of the family apparently remained in Idaho, during this time, there is no record of other family members living in Canada in 1911. 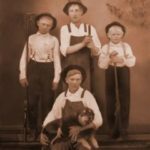 Sons George and Charley would remain in the Clearwater Valley all of their lives. The five daughters would marry and stay in Idaho, or Washington, most of their lives. Louisa passed away in 1924 and Hank followed in 1938. Prior to Louisa’s passing three children, Maria Maud, Luly May and Edward Bryan would precede her. A fourth child, Roxie Isabell (Gleason) Boehl would be killed in a car accident before Hank’s death.